India attracted 8.8 million tourists in 2016 alone, with visitors enthralled by the spirituality, the architecture, the food and the overall spirit of the vibrant country. A trip to India is sure to be full of unexpected surprises and amazing culture, making it a once-in-a-lifetime experience for any keen global adventurer. The state of Tamil Nadu is south India is famed for its majestic Dravidian-style temples, rolling hills and tea plantations. It’s also home to the national symbol of India – none other than the majestic tiger. Bandipur National Park, first established in 1974 as a tiger reserve, is known for its abundance of wildlife. In fact, the park protects several species of endangered wildlife. It’s also the largest habitat of wild elephants in south Asia. 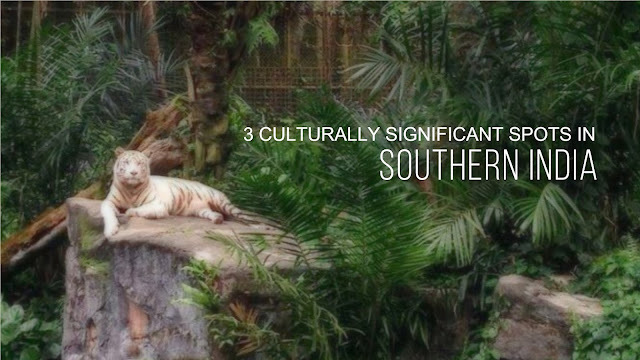 Other species include gaurs, sloth bears, Indian rock pythons, jackals and of course, the tiger. Nature-lovers should certainly head to this spot in southern India to try and capture a glimpse of the elusive tiger, depicted in Indian folklore, art and literature and an important part of the culture and identity in the country. Also known as the City of a Thousand Temples, Kanchipuram is located just southwest of Chennai and was the capital of the Pallava dynasty during the 6th to 8th centuries. It has become a busy modern Indian town that’s famed for its historical and vibrant temples, as well as the colourful festivals that are held there. The area is also known for its vibrant silk saris, carefully and lovingly woven on hand looms by thousands of families in the town. For religion, culture and history, head to Kanchipuram and stand in awe over the range of spectacular temples and experience the essence of life and history in this glorious city. Once the capital of the great ancient Indian kingdom of Vijayanagar, the spectacular site of Hampi has become a very important historical and religious centre in south India. As such, it was awarded UNESCO World Heritage status in 1986. Visit the ruins of Hampi to catch a glimpse of the remnants of the grand empire from the 14th-16th century, which is often described as the last great Hindu kingdom. The Virupaksha temple in particular will take your breath away. Dedicated to Lord Shiva, the temple is the holiest and most sacred retreat for Hindus and it’s still pristine amidst the surrounding ruins. We’re just scratching the surface of culturally-significant spots in southern India in this post. With so many other buildings, ruins and landscapes to discover, you won’t be bored once when you book a holiday to India. For an experience like no other, get immersed in Indian culture and you’ll want to return year after year.